Today, I open up my purse and share with you what’s inside! I love my red purse. I bought it on 2009 at Carson Pirie Scott because I was having a bad year. It still cheers me up when I use it! Watch my vlog to see what I put inside my purse! 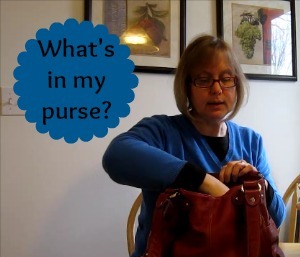 11 Responses to What’s in My Purse? LOL!!! That's what's in the back seat of my car…. So fun. Right now the items in my purse are pretty run of the mill. I'm feeling a little boring. HAHAHA!!! You are just tooo funny Ginny!! LOVE IT!! I've just got to get the vlogging thing going!! Haha! I love it! It was totally unexpected. I don't carry a purse because I had a bad habit of forgetting it places. Now I put everything in my pockets. If it doesn't fit, I don't need it. Oh my goodness, you crack me up! Thank you for that! I'm fighting a bad sinus infection and the kids are tearing the house up… and I so needed a laugh! I was totally not expecting you to pull dinner out of your purse! I used to carry a handbag, but I stopped when I moved to Norway. I only need my (money)purse and that has my driver's licence and my id in it as well! Sorted! I LOL'd! 🙂 Thank you for this!! I just wanted to say thank you for stopping by my blog and participating in my link-up (You linked up a friend of mine, too! 🙂 ). You are such a blessing and encouragment, and that is just one of the many reasons I decided to feature you today! 🙂 You're a great friend! Have an amazing day, Ginny Marie! Hi, Julie! I was thinking you and OneMommy knew each other, but I wasn't sure! I'm glad my vlog made you laugh! My recent post What’s in My Purse?